It was only a matter of time, we suppose. 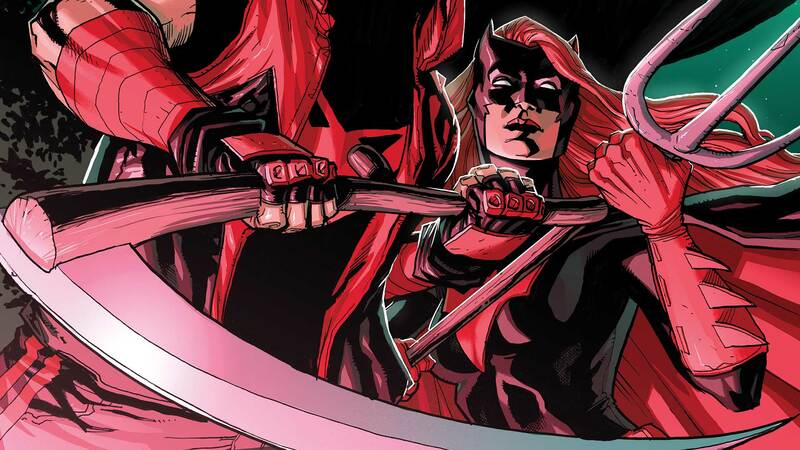 Both Red Hood and Batwoman have had more than a few issues with the Gotham City hero around whom they’ve rallied. On the outs with Batman, Jason Todd has found himself exiled from Gotham and trying to bring down Underlife, a secret cabal of villains that reside in a deceivingly quiet community. Turns out he’s not the only one. Kate Kane has also been on their trail. But the very thing that makes these two vigilantes so alike is also what makes any potential partnership between them so uneasy—neither are known for playing well with others. And if both have found themselves continually at odds with a relatively straight shooter like Batman, how long will it be before they lose patience with each other. Or will these two troubled souls find a small bit of solace in each other? Those are questions for later! First, Jason and Kate will have to figure out a way to take down the gang of monsters that have attacked them. Fortunately, they’re robot monsters, so the gloves can come off…and the pitchforks can come out. RED HOOD: OUTLAW #29 by Scott Lobdell, Pete Woods and Rex Lokus is in stores this Wednesday.